MyDOTA 2 MOD Project was the idea of Silver Dota MOD. This project transforms your Warcraft III into DOTA 2 look alike. MyDOTA 2 MOD is now working together with MeSH DOTA. With the help of MeSH DOTA, MyDOTA 2 MOD wil improve it's MOD. This project was proposed because of Mr. Kittikoon Tepchan's DOTA HQ work, his work is truly anticipated, sophisticated and HIGH QUALITY, he wants to let the gamers/players t feel like they were just like playing DOTA 2. MyDOTA 2 MOD was developed for low end PC users, so that they can experience DOTA 2 MOD even they have low end computers. TEAM AHO (the group where Silver Dota MOD belong)was the one responsible on developing MyDOTA 2 MOD Installer and Patcher. And also TEAM AHO just gathered all these stuffs in PlayDotA.com and compiled it then finalized and finally released a Full Installer . We acknowledge everyone who support this project. The mentioned people above,they were the best rippers nowadays, without them MyDOTA 2 MOD will be nothing it be just a dream and impossible to believe. We give thanks to them for this project. We claim or own stuffs around here, we just collected and compiled all stuffs from PlayDotA, credited everyone who's involve. 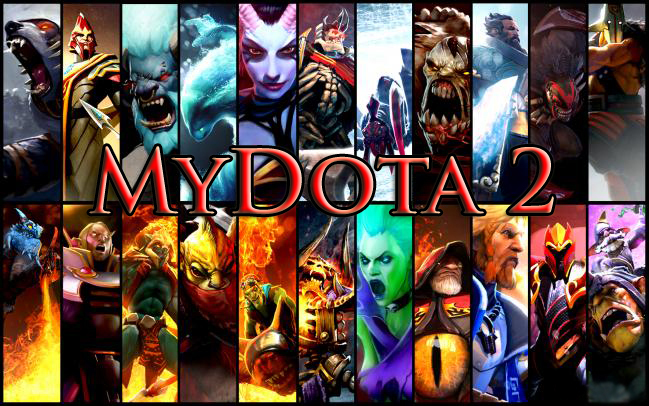 This MOD project is for all people out there who wants to experience DOTA 2 on Warcraft III. TEAM AHO does'nt compete or having a competition to other MOD teams, we just want to share this project to people who wants to play DOTA 2 MOD on their low end PC's. Kittikoon Tepchan's (Tonucki) DOTA HQ project is the high quality and high definition MOD today, because of his hardwork and the dedication doing his project this DOTA-HQ becomes succesful. Please support his MOD by visiting his Facebook page. This MOD is more cool and magnificent than MyDOTA 2. DOTA HQ lets you feel like your playing DOTA 2 in an average to high end PC's, while MyDOTA 2 also let you feel like your playing DOTA 2 in low spec PC's. We recommend to check this MOD!, and also DOTA-HQ is the reason why MyDOTA 2 MOD was developed, HQ for average/high end PC users and MyDOTA is for low end PC users. "Bringing you DotA 2 Experience in Warcraft III Frozen Throne"
We encourage everyone to play DOTA 2 of Valve. This is the most anticipated strategical game in the world, with the cooperation of Blizzard.